LOS ANGELES -- Steady and sometimes heavy rain in Southern California is shaking loose rocks and causing flooding on some roadways as an El Niño-powered storm moves through the region. The city of Malibu says rocks fell Tuesday on the road through Malibu Canyon, damaging four vehicles. The route through the steep Santa Monica Mountains is a heavily traveled commuter route, and the city says drivers should expect delays. To the northwest, flooding has closed about a mile of beachside Harbor Boulevard in the city of Ventura. Police Cmdr. Tom Higgins says water is about a foot deep. In Los Angeles, officials say no major roads are closed and fewer than a thousand utility customers lack electricity. Authorities say the Sepulveda Basin -- a flood-control area along the Los Angeles River -- is filling as expected. Californians were warned against abandoning conservation efforts Tuesday as several weeks of storms spawned by El Niño began hitting the West Coast. Heavy rain and snow are welcome after four years of drought in California, despite their potential for causing flash floods and mudslides. But even a very wet winter won't be enough to replenish water supplies depleted by four years of drought. The powerful El Niño system -- a warming pattern that lifts vast amounts of precipitation from the Pacific Ocean, funnels it across North America and alters weather worldwide -- is expected to cause unusual weather nationwide for months. As much as 15 inches of rain could fall in the next 16 days in Northern California, with about 2 feet of snow expected in the highest points of the Sierra Nevada, said Johnny Powell, a forecaster with the National Weather Service. Flash flooding and flows of mud and debris were a concern in places around the state, especially in wildfire burn areas. Rocks fell Tuesday on the roadway through Malibu Canyon, damaging four vehicles and clogging a heavily traveled commuter route through the steep Santa Monica Mountains, and Los Angeles police were rousting the homeless from normally dry riverbeds. Altogether, the storms should bring massive amounts of rain and snow to a very parched state this month, but water managers won't be able to fully estimate this year's snowmelt until April 1, when the snowpack is typically at its deepest. "Mother Nature has a way of surprising or disappointing us,"Department of Water Resources spokesman Doug Carlson said, explaining why water conservation must continue through what looks to be a wet winter. CBS News' Ben Tracy reports that El Niño is an intense warming of the Pacific Ocean near the equator that changes weather patterns around the world. This is one of the largest on record. "Ready, set, here comes El Niño," said Bill Patzert a NASA climatologist. What should we anticipate happening? "Here in Southern California six inches of rain in one week definitely guarantees some flooding, some mudslides -- especially below the burn areas," said Patzert. Areas such as Ventura, where a wildfire charred the hillsides just before Christmas. In Glendora, California, Eric Erby was stocking up on sandbags. "Flooding could happen any time anywhere. It depends on how much, so either way I'm going to make sure I'm prepared for it," said Erby. Californians used 20 percent less water this past November than they did in November 2013, before Gov. Jerry Brown declared the state's water emergency, the Water Resources Control Board announced Tuesday. That falls short of Brown's 25 percent conservation mandate for a second straight month. California's water deficit remains so profound that a "steady parade of storms" like these will be needed for years to come to end the relentless drought, said Mike Anderson, climatologist for the state's Department of Water Resources. "We're at least on a good trajectory," he said. "We've got to keep it going." El Niño storms in the early 1980s and late 1990s brought about twice as much rain as normal, while also causing mudslides, flooding and dangerously high surf, Jet Propulsion Laboratory climatologist Bill Patzert said. The National Weather Service issued flash-flood watches for many California communities ahead of the storm. Places where last year's wildfires left steep hillsides dry and barren were particularly vulnerable to mud and debris flows. Residents of the Silverado Canyon burn area in Orange County and the Solimar burn area in Ventura County were urged to consider evacuating, but have not been ordered to do so. "The best time to prepare is before a weather event happens, but there is still time to prepare at least a basic emergency kit for your home, your car or your place of work," said Brad Alexander, spokesman for the Governor's Office of Emergency Services. 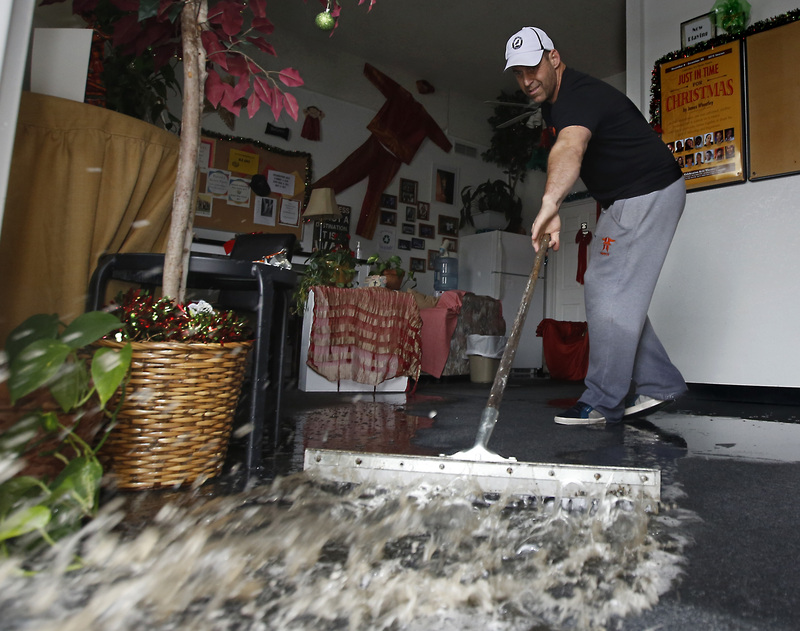 As steady and sometimes heavy rains fell across Los Angeles, Mayor Eric Garcetti urged people to clear gutters and anything in their yards that might clog storm drains, and to stockpile sandbags if their home is susceptible to flooding. Garcetti also said that officials have mapped the city's homeless encampments for the first time, and that shuttles will bring people to shelters with space for 6,000 beds. Los Angeles Fire Chief Ralph Terrazas said swift-water rescue teams are ready to deploy, but he'd rather not use them. Authorities are hoping to avoid a repeat of last September's rescue of a homeless man who scrambled up a tree with his dog when the Los Angeles River quickly grew to a torrent during heavy rains. The storms are also whipping up large ocean swells that could generate hazardous breaking waves at west-facing harbors. Ventura's Harbor Boulevard was already closed Tuesday morning by flooding about a foot deep, police there said.